Does your child enjoy art, music and dance or have an interest in writing, producing films and taking photos? 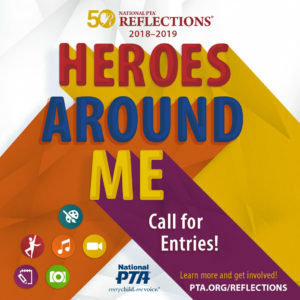 Then consider unleashing your child’s inner artist with PTA Reflections competition! The National PTA Reflections program encourages students of all ages and abilities to explore and be involved in the arts in an educational way. Through the program, PTAs across the country urge students to create and submit original works of art in the medium of their choice, reflecting on a specific theme. The theme this year is “Heroes Around Me,” calls for your child’s own unique interpretation through the arts. Each entry will include an artist statement for the students to elaborate on how their work relates to the theme. The six mediums that students can create work in for the contest are: Dance Choreography, Film Production, Literature, Music Composition, Photography and Visual Arts. There also is a special artist division to provide all students with the opportunity to participate. GRADE DIVISIONS. Students may enter in the appropriate division for their grade (Primary: Preschool-Grade 2; Intermediate:Grades 3-5; Middle School: Grades 6-8; Special Artist: All grades welcome). We are looking for 6 volunteer judges to review submissions during the second half of October. Entries can be reviewed at home and judging criteria will be provided.